Feminist scholars have comprehensively examined why women suffer from body image woes (see Bordo, 1993). On the surface, it seems strange to think that pregnant women fear ‘fat’. After all, pregnancy is a time when women are supposed to gain weight. This article draws on longitudinal narrative data to examine experiences of weight gain and ‘fatness’ in early periods of pregnancy among women in Melbourne, Australia. Informants’ accounts demonstrate that they constantly feared that their pregnant corporealities would be ‘misread’ when they were not unambiguously ‘pregnant’. 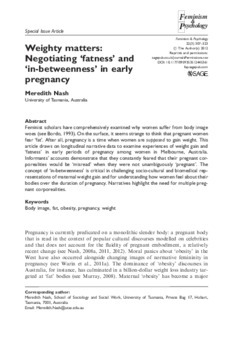 The concept of ‘in-betweenness’ is critical in challenging socio-cultural and biomedical representations of maternal weight gain and for understanding how women feel about their bodies over the duration of pregnancy. Narratives highlight the need for multiple pregnant corporealities.